“Lee Yuet/Yut Ying (Hazel) Affidavit photo” 1937, Chinese Exclusion Act case files, RG 85, National Archives-Seattle, Lee Yuet Ying (Hazel ) case file, Seattle Box 582, 7030/5149 & Box 710 7030/10411. The file for Hazel Ying Lee (Lee Yut-Ying 李月英) tells us that she left for China on 4 March 1933 and returned on 12 December 1938. While she was visiting her father’s village in the Toyshan District, Kwangtung Province, she received word that her Form 430, Citizen Return Certificate, was destroyed in a fire in Hong Kong. When Lee wanted to return to Portland she went to the U.S. Consulate in Hong Kong for help with her documentation of her U.S. citizenship. They advised her to obtain an affidavit with a current photo swearing to her citizenship. Hazel Lee’ s brother [the file does not say which brother] went to the Immigration office in Portland to assure that the paper work was in proper order so that Hazel Lee would be admitted when she arrived in the Port of Seattle. The Portland immigration office had a copy of Hazel’s original approved 1933 Form 430 on file. 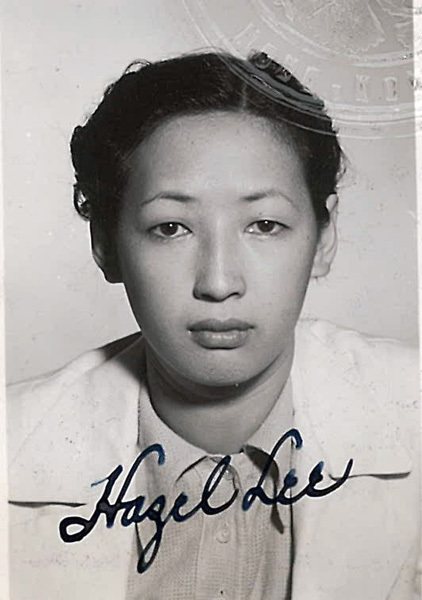 When Hazel arrived in Seattle in 1938 the 1933 information was compared to the new affidavit prepared in Hong Kong and Hazel Lee was admitted to the United States. Hazel’s 1933 interrogation stated that Hazel attended Atkinson school and High School of Commerce; she was employed at H. Liebes & Company doing stock work and elevator operation; her father, Lee Yet 李乙died in 1930; and her mother was living in Portland. Hazel had nine siblings: Harry Lee, Victor Lee, Howard Lee, Daniel Lee (Lee Wing Doong 李榮宗), Rose Lee, Florence Lee, Gladys Lee, Frances May Lee. Harry and Rose were born in China and the others were born in Portland. Hazel was going to Canton City to visit and study. Hazel’s mother, Wong Shee, maiden name Wong Seu Lan, was a witness for her. Dr. Jessie M. McGavin, a Caucasian female physician, attended to Wong Shee for Hazel’s birth on 25 August 1912. Her birth certificate is included in the file. The reference sheet in Hazel’s file includes the name, relationship and file number for Hazel’s parents, four brothers and three sisters.